Kathleen A. Stamm is an Associate with Bonezzi Switzer Polito & Hupp Co. L.P.A. Ms. Stamm concentrates her practice in the defense of physicians, hospitals, nursing homes and other healthcare professionals in litigation involving claims of professional negligence related to patient care. Prior to joining the firm, Ms. Stamm spent sixteen years in the pharmaceutical industry. During this time, she gained extensive experience in a wide range of healthcare areas, working primarily with hospitals, hospital systems and specialists throughout Northern Ohio. Ms. Stamm utilizes her experience and knowledge of the healthcare field to bring a unique perspective to the representation of her clients. 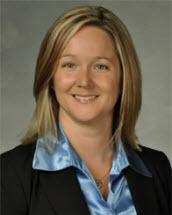 Ms. Stamm graduated from the University of Toledo College of Law, with a Certificate of Concentration in Health Law. While attending law school, Ms. Stamm worked with the Advocates for Basic Legal Equality (ABLE) in the Medical-Legal Partnership. Ms. Stamm obtained her undergraduate degree from Bowling Green State University.